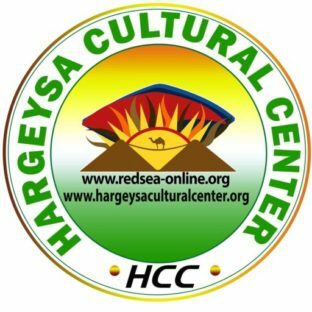 February has a special place in the hearts of Somalilanders specially with young and change seekers are the center of attention for all of the activities in Hargeysa Cultural Center most importantly for the Academic Dialog Session. Looking forward for the celebration of Somaliland youth day on February 20, we Started the month with the session on “Migrants on the Margins: a research project of the Observatory of Conflict and Violence Prevention (OCVP) an institution that is serving as a member of international research partners to the Royal Geographical Society’s Field Research Program that is under way in collaboration with researchers from UK Universities (Sussex, Durham and School of African and Oriental Studies at University of London) to investigate the vulnerability and opportunities of internal migrants from rural and pastoral areas of Somaliland. The research focused particularly on refugees those who are living in three Internally Displaced Camps(IDPs) in Hargeisa (Statehouse, Digaale Camp and Camp A). This three years field research project is simultaneously taking place in four of the world’s most pressured cities, including Hargeisa(Somaliland), Harare(Zimbabwe), Colombo (Sri Lanka) and Dhaka(Bangladesh) with the hope to draw on systematic and comparative data on how these patterns and management techniques vary from one city to another. To present the research’s current status along with basic findings and methodological aspects, we had Dr Laura Hammond (SOAS) and Dr Benjamin Dix (Positive Negatives, an arts-based company working with the project) along with Ms. Ayan Yousuf (OCVP). The objective of the research is to understand the experiences and challenges that the displaced face in moving into the city and trying to find sustainable livelihoods. The research also considered the challenges faced by municipal authorities in responding to this issue. 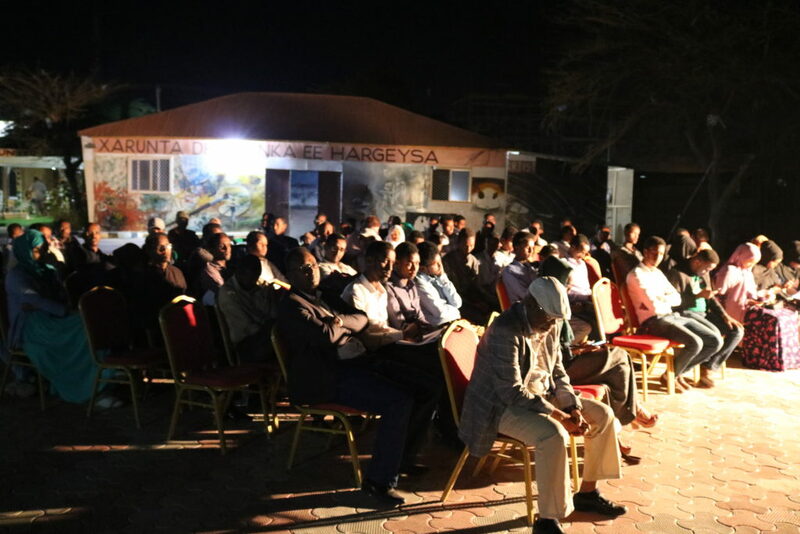 As a background and basic findings, the researchers presented that Hargeisa city has nearly one million inhabitants and its economy is mainly dependent on remittance and livestock export. Indicating the fact that the local authority is also struggling to improve the city’s infrastructure and public services which are either absent or in a poor condition, cyclic droughts in the country is stated as a factor that further complicated the situation and have forced many rural and pastoral communities to move to the city in search of survival. The researchers further elaborated that whenever there is drought in the country there are new arrivals, who often find themselves in informal settlements. The three sites house IDPs who are mainly from rural and pastoral communities, but the camps differ in proximity to the city Centre, access to services (including water, education, transportation and work), time of establishment and population which made the challenges faced by the IDP to vary accordingly. The State House, established in 1991, is believed to be the oldest IDP camp in the city, housing 4,500 families at the Centre of Hargeisa. In contrast, the newer Camp A looks like a temporary camp: residents live in simple huts of plastic and old cloths with the hope they will be resettle in a permanent location. Finally, Digaale camp, established in 2012, has an estimated population of 900 families and is located 6km outside the city. Unlike the other two camps, the residents live in permanent metal houses built with the support of the Norwegian Refugee Council (NRC) and Danish Refugee Council (DRC). On the aspect of the research methodology, the research is using the Q methodology which was devised to allow an individual to represent his or her vantage point for purposes of holding it constant for inspection and comparison. The key to this approach is to consider data in terms of the individual’s whole pattern of responses, a self- reference rather than looking for patterns among people. People and not tests are the variables is the fundamental perspective of the methodology (McKeown & Thomas 1988). With this methodology, participants are asked to decide what is meaningful and significant from their perspective by using a Q-sort. From this process an essentially relative set of evaluations is produced. The data from several people are then factorially analyzed; this reveals groups of individuals who have ranked characteristics in the same order. This was explained by Ayan Yusuf the senior researcher of the local partner who further stated that they followed the principle to have an appropriate set of statements that come from the concourse that exists around the issue under consideration, as these are the essence of the subjectivity that will later emerge from the sorting of statements by the participants in addition to making sure that the statements used in Q methodology to be representative of the topic so that there are statements that people can agree with and statements that people can disagree. The other aspect of the research which is expected to have unique presentation is that the statements collected and agreed by the informant on the bases the Q-sort method will later be presented as a story line. This was explained by Dr Benjamin Dix from Positive Negatives, an arts-based company working with the project who has been using comic art as a way of presenting research outcomes. As the research is a work in progress, findings in a generalized form were not part of the presentation. However, the methodological uniqueness and observational issues were part of the follow up questions and discussion. The night also had another mission of providing information on the MSc scholarship at SOAS explained by Dr. Laur Homound the leading coordinator of the scholarship which was an interesting point for the young Somalilanders who has become a major participant of the platform. Our second presenter for the month was Ebba Tellander a Doctoral Researcher at Peace Research Institute Oslo (PRIO) and International Institute of Social Studies in the Hauge (Erasmus University Rotterdam) whose PhD project focuses on civic mobilization in Somaliland’s recent history. Her research is affiliated with the Societal Transformation in Conflict Contexts project, funded by the Norwegian Research Council. She was a Researcher at the Social Dynamics Department and a Communicator at the Communication Department at PRIO. 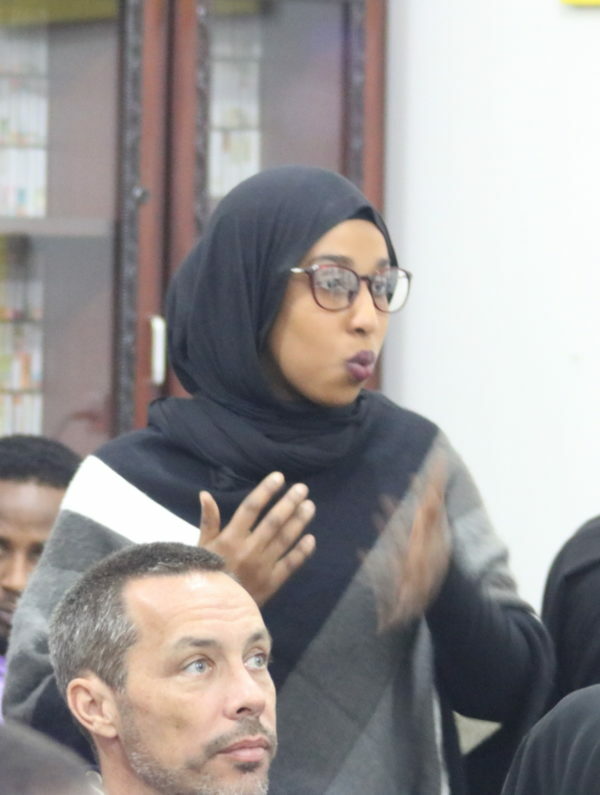 Her previous research focused on the role of the Somali diaspora in Norwegian foreign policy towards the Somali region. Even though she is in her initial stage of her research work, the topic she is working on has managed to pull in many issues and aspect in Somaliland. It couldn’t have been in a better timing to talk about her research area as Somaliland National Youth Day is commemorated every year on 20th of February in remembrance of the youths who play a huge role in the ongoing development in the country. More specifically the researcher is taking the UFFO group as her case study owing to the fact that those youths who were all locally educated initiated a volunteerism program at the Hargeisa Group hospital under the banner of UFFO with the objective of creating sanitary conditions at the then northern Somalia main health facility. This was as struggle and resistance against the then Somalia dictatorial government of Mohamed Siyad Barre who in the 20th February of 1982 arrested and sentenced to death a number of youth in Somaliland that escalated to crackdown by the dictator’s forces accompanied by security agents from the National Security Service-NSS elicited anger by local youths in Hargeisa through unprecedented protest demonstrations. It is in honor of UFFO members and their activities that stimulated resistance to Barre’s oppression by ordinary locals, the government of Somaliland declared 20th February as a national youth day. This is how the presentation of Ebba intertwined with the commemoration as her research is aspiring to investigate peace development through volunteerism-based resistance movement. The feedback from the youth association members who were attending the discussion along with UFFO members themselves enlightened the academic dialog and assisted the researcher to obtain a more digested foundation for her work progress. February went more interesting considering the third week dialog session which was held on the commemoration of the International Mother Language day whereby we lunched the first Somali language audio book a translation of “We Kissed the Ground” a dramatic firsthand account of a migrant’s journey from Somaliland to the Mediterranean published by the Rift Valley Institute in 2017. 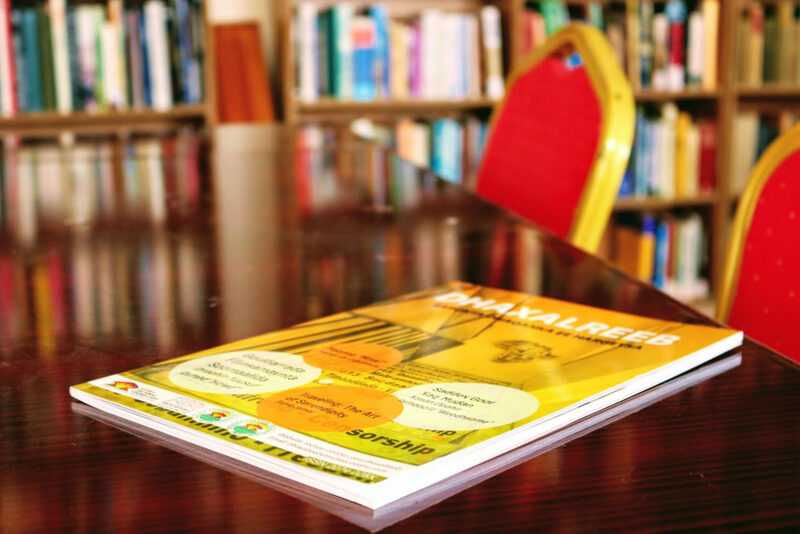 We also had the launching of Dhaxalreeb (1st issue of 2018) our quarterly bilingual magazine (English and Somali) that will serve as another platform to provide literature, academic dialog and traveling information about Somaliland as you are reading it now. Music performance was also part of the entertainment educational structure of the event. Concluding the month with the thought provoking documentary of The Life of Malcolm X which has a dimension that has not been given much attention. The documentary presents how Malcom X played as one of the influential Muslims. The platform has once again served its intention of linking scholars from all corners of the world who has taken Somalia, Somaliland and Horn of Africa as their area of interest with a strong sense of developing academic discussions in Somaliland lead and owned by local scholars and youth. It is not a surprise then that we have grown to 258 people in our mailing list which we are certain will grow more. The attendance by young Somalilanders who the vibrant voice of the discussion are assures the sustainability of this platform as they will be the next presenters with the rising academic aspiration they have. Well with such a celebratory mood of the month of February that shed a light on the academic discussions we had, we are looking forward to the coming presentation with open hand and heart to anyone who is heading to Hargeysa Somaliland to join our sessions be it as presenter or an attendant. 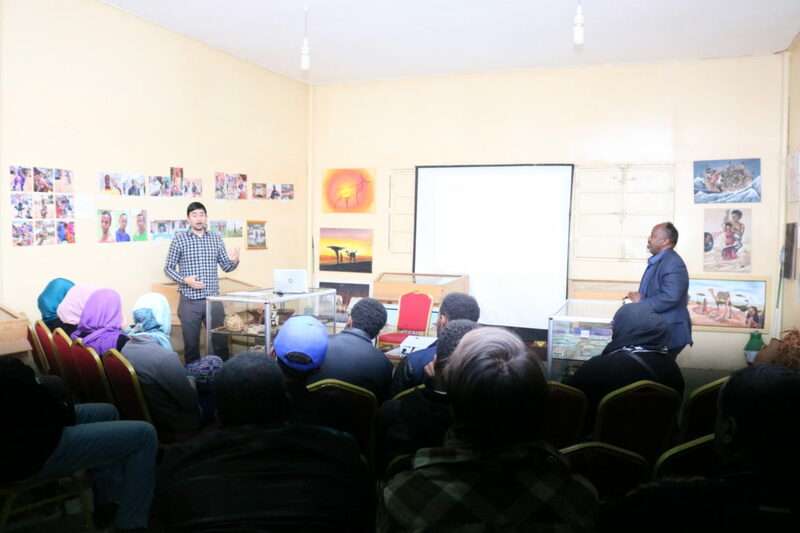 During this presentation our academic dissuasion was guided by a project work that focuses on one of the academic success stories from Somaliland; Abaarso Tech school. Mr. Harry Lee an American Filmmaker who is currently pursuing a Master’s degree in Education at Harvard University. He has spent three years in Somaliland teaching at Abaarso School and shared with us his findings on challenges and opportunities for the students to join the highly reputed institutions in the West. The feature-length documentary which he made with his partners Ben Powell and Kate Griendling, about five Abaarso students who are applying to American schools with a lot of collective dreams and expectations on their shoulders set the discussion on multiple direction including appreciation for of artistic presentation of significant stories that shapes westerns understanding of developing nation. 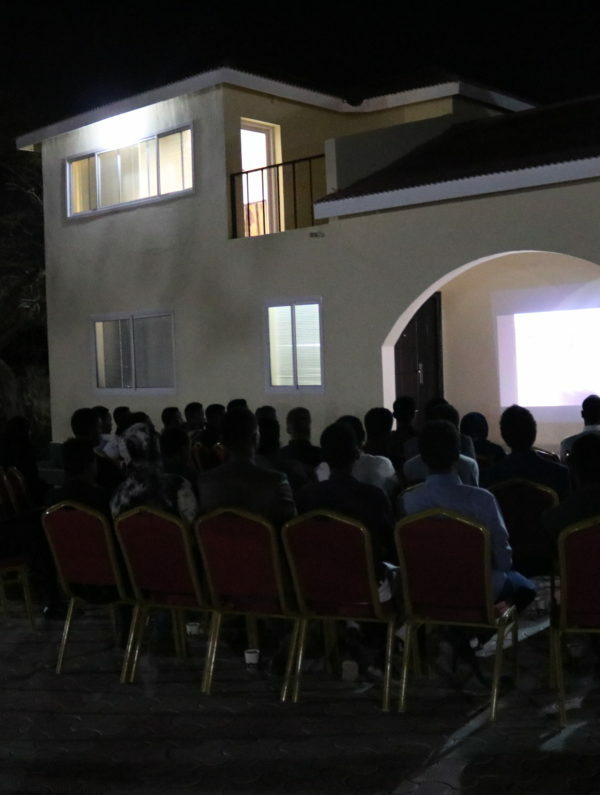 It was also used as a way to reflect the need to come up with a well-researched achievement stories that can inspire young Somalilanders through the voice of youth they related too. The story detail follows Abdisamad, Roda, and Amaal who are students at Abaarso School of Science and Technology outside Hargeisa. 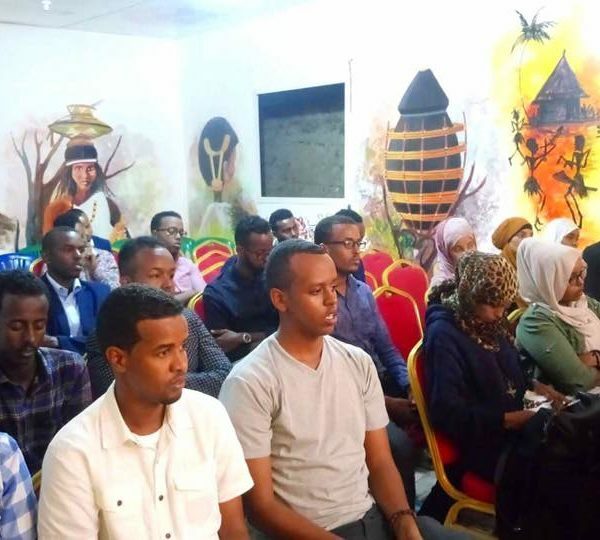 Abaarso is an American-run school where Somaliland students attempt to secure scholarships to US universities so they can be better prepared to lead their country. Each of these three students has different motivations and dreams while at Abaarso. The odds are stacked against them as they apply to American schools but they hold out hope for a better future. As it has become a prominent space for academic discussion, this forum has grown in number of area covered and attendants. Even though its weekly based aspiration is challenged with the fact that it is not possible to have PhD presentation every week, expanding its domain by having presentations of related published articles, masters research works that have strong relation to a project in the PhD level has gave the chance to hold the sessions on consistent base. The range of participant is still mainly PhD students but once in a while when we have international scholars who could be benefit not only to the PhD circle but the overall academic development in Somaliland so as to make sure appropriate information collection strategies and locations are used for research which usually puts a question on how international researcher get local context in an objective manner directs our decision to incorporate such studies. this is well assured by making such presentation a public event in comparison to the closed PhD days presentations in order to reach every interested academic community member to takes part in it. the practice of making it a public event also is applied to presentations of internationally renowned scholars whose experience is significant to the wider community. The case of Dr. Severine Autesserre Dr. Michael Walls and Dr. Scot Pegg’s presentation nights are worth mentioning here. The growing number of attendants and mailing list members is another encouraging fact that tells how much the forum is attaining its objective of identifying research works on progress, connecting researches, sharing experience and developing collective responsibility of assuring quality research works practice are utilized in researching socially significant matters. On an average we have had 245 participants with local and international mix with young Somalilanders taking the higher portion for attending most of the presentation even though our November presentations brought more of international participant due to the election observation mission for the presidential election. The gender balance seems to be more of male dominant both in number of researches presented and also attendants for the events which we hope will have a different future turn out. All in all, the forum is going in the right direction which will yield the aspired input for the 40th Somali Studies international congress. We screened ‘Life is Waiting: Referendum and Resistance in Western Sahara’ directed by Iara Lee to lead the way for another intellectual dialog. Four decades after its people were promised freedom by departing Spanish rulers, the Western Sahara remains Africa’s last colony. While a UN-brokered ceasefire put an end to armed hostilities in the territory in 1991, the Sahrawi people have continued to live under the Moroccan armed forces’ oppressive occupation, and what peace exists in the area is fragile at best. Tens of thousands of Sahrawis have fled to neighboring Algeria, where over 125,000 refugees still live in camps that were intended to be temporary. In spite of these difficulties, a new movement, with youth at its center, is rising to challenge human rights abuses and to demand the long-promised referendum on freedom. Today’s young generation is deploying creative nonviolent resistance for the cause of self-determination. In doing so, they’ve had to persevere against a torrent of conflicting forces. While risking torture and disappearance at the hands of Moroccan authorities, they’re also pushing back against those who have lost patience with the international community and are ready to launch another guerrilla war. The new film from director Iara Lee will examine these tensions as it chronicles the everyday violence of life under occupation, giving voice to the aspirations of a desert people for whom colonialism has never ended. As the forum is centering Somaliland/Somalia based research with internationally acknowledged methodology and research practice, the three presentations we had resonated on Somaliland statehood and mechanisms for development that coincided with the election the state was on. The third presentation was by Miss Amanda Møller Rasmussen who has a background in Social Anthropology of Development (MA) from the School of Oriental and African Studies as well as in African Studies (MA) from the University of Copenhagen. She has been affiliated to the Centre of African Studies at Copenhagen University as a research assistant and project coordinator. 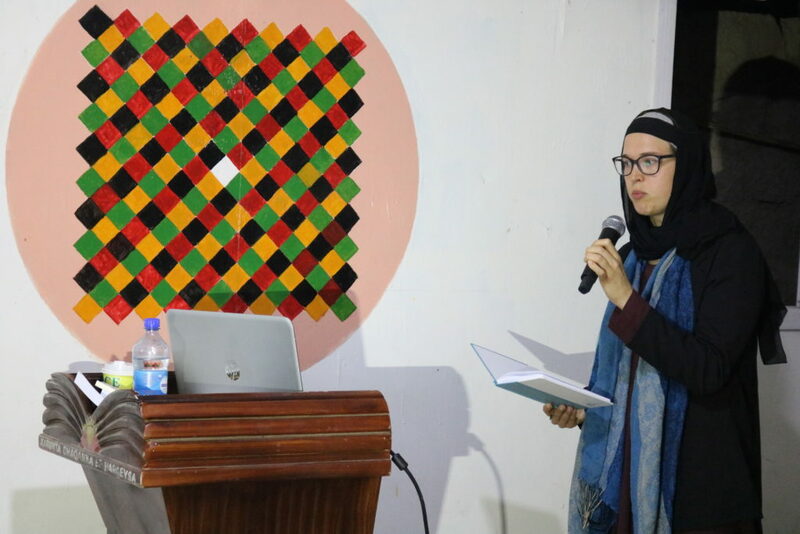 Her research has mainly focused on Somaliland’s fishery sector and its development initiatives, exploring the various economic, social and epistemic networks that surround Somaliland’s fishery development on both a local and global level. 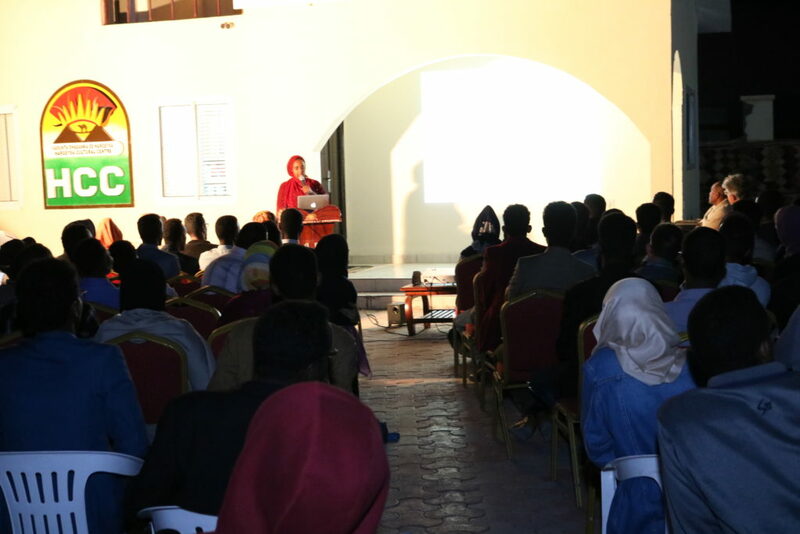 During her presentation she stated that although fisheries in Somaliland have seldom caught the attention of scholars or international actors, the successful articulation of a linkage between “Somali piracy” and regional fisheries have led to more and more development attention, resources and technologies targeted at the Somaliland fishery industry. She argues that this has resulted in linking both local and global actors in an effort to securitize the region. Her presentation reflected more upon how these narratives are used to address issues of poverty and fishery development. At the same time, she investigates how these narratives have made the Somaliland fishery industry – a marginal and often unnoticed industry with little influence on the global community – into an arena from where different local and global actors are able to negotiate their interest, positions, and the allocation of development resources in a globalized world. 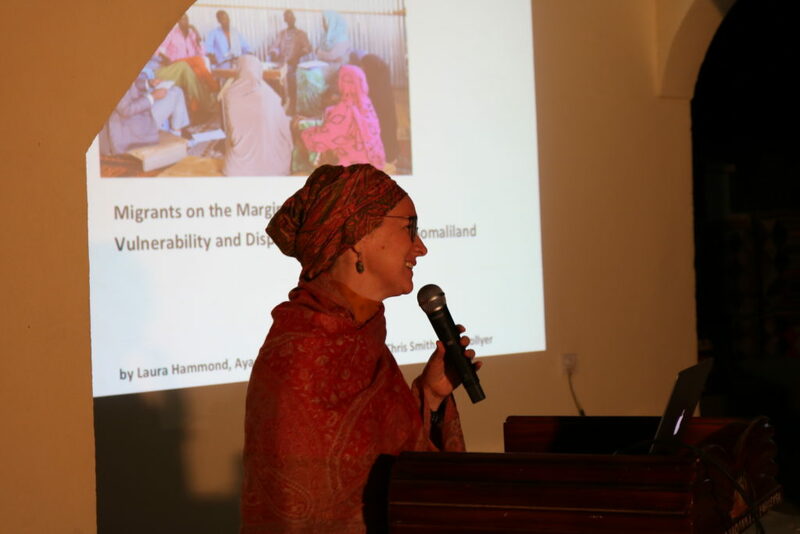 In such a process establishing, appropriating, and re-establishing ideas about potential dangerous fishermen and the legitimacy of international development by linking up to local desires, global agendas, and the development epistemic communities that surrounds fishery development in Somaliland is mandatory was her point to take from the presentation. As always her presentation was also followed by supplementing perspectives and challenges that shadowed fishery which is an industry Somaliland has a wider opportunity for national development. 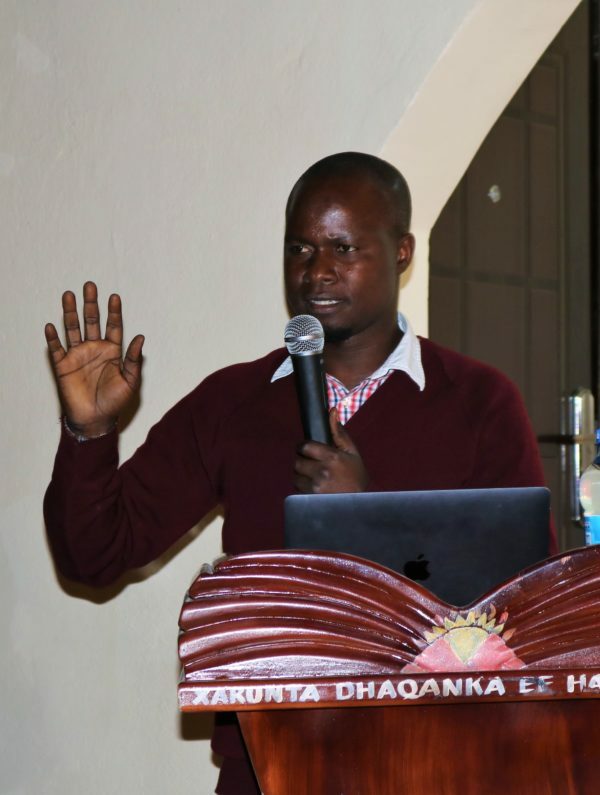 With the well ignited appetite by Dr. Pegg’s presentation, we had our following Wednesday dialog with the young scholar Mr.Yusuf Serunkuma who is a PhD student at Makerere University Institute of Social Research (MISR), Makerere University in Kampala. His work focuses on exploiting the craft and aesthetics of popular culture (poetry, nationalist music, monuments, popular narratives and practices, national celebrations, fliers and symbols of statehood such as the national flag, and recent ethnography, 2015) mostly through ethnography, discourse and literary analysis, Yusuf’s work examines the ways in which Somaliland political identity and national consciousness is mobilized as an independent nation state seceding from Somalia. Using the case study of Somaliland, as a form of de-imagined nationalism, Yusuf then attempts to theorize secessionist nationalism (Eritrea, South Sudan, Pakistan, Biafra, Catalonia, Scotland etc.) as it is distinctly different from other forms of nationalism especially anticolonial nationalism. Participants were impressed with the diverging perspective he was trying to illustrate how identity depiction matters by negating the traditional ‘I am this because I am not that’ which he said unless aspiring nations start centering their self-determination in a way that starts and ends in what they are, he said will still be in a continuous challenge of waiting. 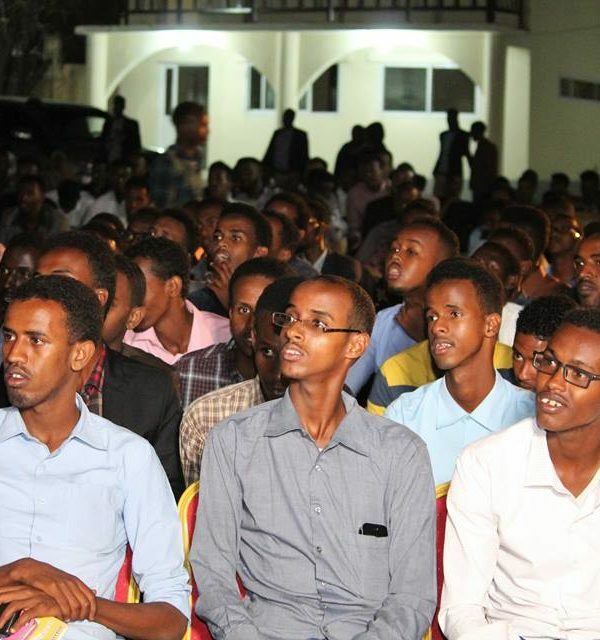 In his explanation he stated that in Somaliland’s nationalist project he has two arguments: Firstly, he presents that through its “officially sponsored” popular cultural items (such as the symbols of statehood, monuments, nationalist music and poetry, select events such as the arrest of the Horn Stars returning from Mogadishu in 2015 etc. ), Somaliland has constructed a public identity that thrives on an intimate juxtaposition/foil with Somalia. He argues that is perilous as there is potential for nationalist amnesia/violence once the foil disappears. Secondly, that although most of scholarship rightly celebrates the peace and stability in the country of the last 26 years, sustaining the images and histories of violence in its public identity and institutional symbolisms suggests it has remained a country at war. He asserted that Somaliland ought to build a national consciousness without Somalia as its referent. “my suggestions include monumentalizing cultural and SNM heroes, first presidents, significant historical figures etc.” Secondly, by defining itself in essentially internationalist terms (democrats, anti-terrorism, victims of a genocide), Somaliland surrenders both the power to define itself in its own terms (say, cultural-traditional) to the international regime of power, which defines those terms. As well, this has potential to plunge the country into cultural/nationalist amnesia once the terms of the debate shift. On the bases of this presentation participants provided pro and critics by giving example of struggle all over the world which lighted up the discussion. Among the core comments were the international principle of state recognition being binding to have a referent state be it as a mother state or patron which are central in the self-determination process. 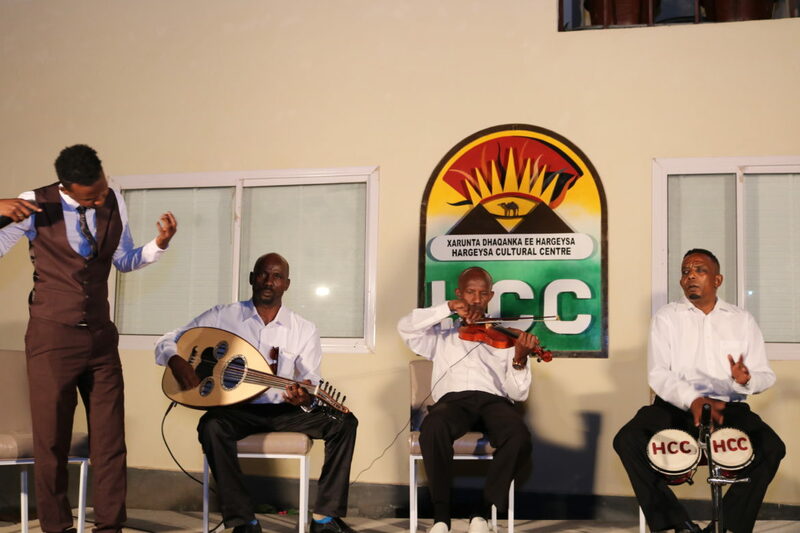 well his argument popular culture shall be used to identify what Somaliland is as it stands on its own description was concluded with a performance by HCC Cultural Dance team that played ‘Hobbay’. Our last three presentations also evolved with similar tone but even got a wider reception owing it to the fact that they were part of the historic, successful and democratic election Somaliland had. All the three presenters were part of the International Election Observation mission as a Sort term observer. First, we had Dr. Scott Pegg Professor and Chair of the Department of Political Science at Indiana University Purdue University Indianapolis (IUPUI). His presentation on ‘Twenty Years of De Facto State Studies: Progress, Problems and Prospects’ surfaced issues centering on the struggle for self-determination with in the past 20 years research including Somaliland whereby he stated that the challenge remains constant starting from naming such entities, irregularities in international principles and limitation on new perspective of academic dialog on the area. He further asserted that fundamentally there remains a continued failure to reach agreement on the number of these entities that exist or have existed since 1945. The nuanced and empirically rich academic literature has also largely failed to advance journalists or policymakers’ understanding of de facto states. Yet, the prospects for de facto state studies remain bright. More diverse comparative work, renewed attention to how engagement without recognition might facilitate the participation of unrecognized entities in international politics, a renewed focus on parent state strategies, and increased attention to de facto states and conflict resolution are areas deserving of greater scholarly attention was the pillar point he wanted to pass. 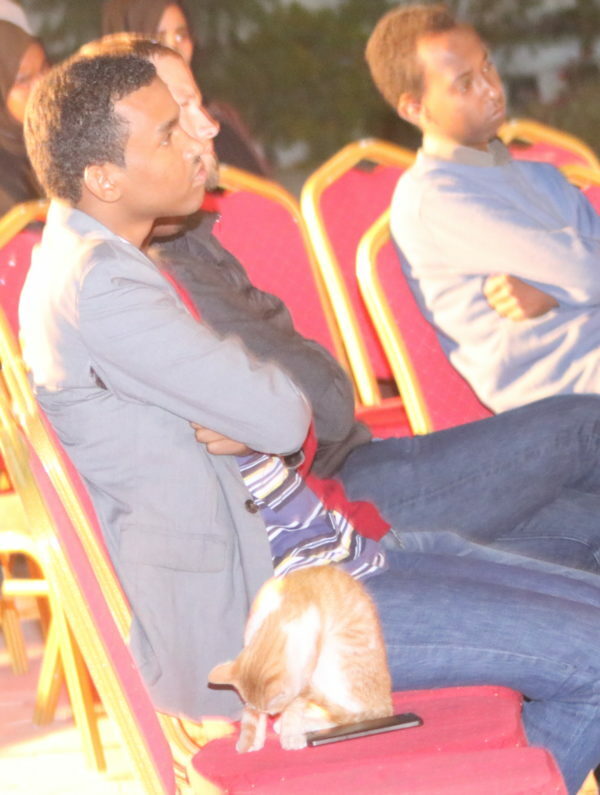 Recent developments from Catalonia to Somaliland were discussed with in this presentation framework which lead to heated, informative and interesting dialog night. The presentation by Dr. Michael Walls was another critical presentation we had in developing academic space for research and knowledge transfer in Hargeyisa Somaliland. 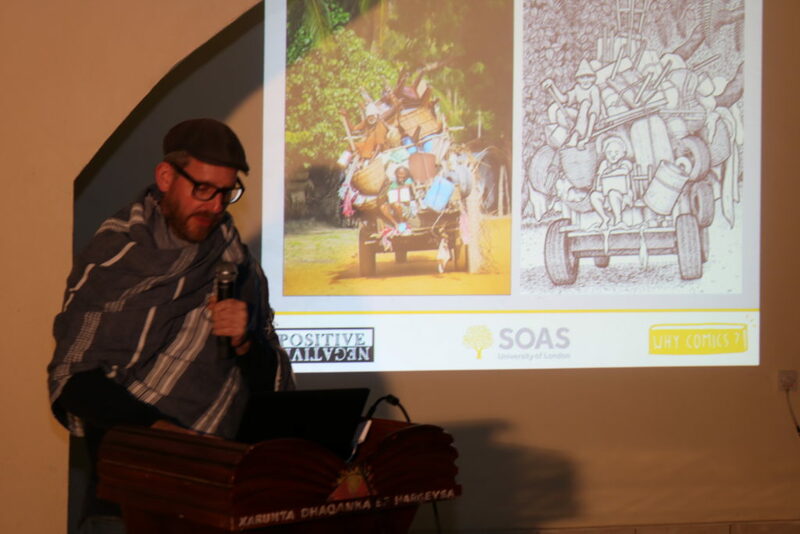 Michael Walls (PhD) is a Senior Lecturer at UCL’s Bartlett Development Planning Unit (DPU), and for the past fourteen years, his research has focused on the political economy of the Somali Horn of Africa, including the evolving political settlement in Somaliland. He has also been a part of the coordination team for international election observations in Somaliland in 2005, 2010 and 2012 as well as the 2016/17 Voter Registration process, and was Principal Investigator for the ESRC-funded research project ‘Political Settlement in Somaliland: a gendered perspective’. Michael is currently heading the international Election Observation Mission for Somaliland’s 2017 presidential election. Somaliland is attracting increasing attention for its stability and the cycle of elections that has taken place since a constitution was formally adopted by referendum in 2001. This event will consider research conducted by Michael Walls, culminating in the book ‘A Somali Nation-State: History, culture and Somaliland’s political transition’. In that publication, Walls argues that, rather than undergoing a process of what is frequently described as ‘democratization’, Somaliland can more accurately be seen as negotiating the difficult transition from a discursive system of extreme democracy to a representative one more suitable for nation-state governance. That transition has proven difficult in other societies that have experienced it, and many of Somaliland’s own challenges can be better understood from that perspective than the one provided by more common narratives. Walls’ own research on this has spanned almost a decade and a half, and in the early days took a constructivist approach, with consequent impact on the methodologies employed. Relying heavily on qualitative and interview-based methods, the research relied on triangulated narratives to build a picture of the understandings of participants as to the processes that have supported Somaliland’s transition. This session will consider both methodological approaches and the findings of that research. Participant of this presentation stressed the relevance of such spaces specially with well experienced presenters like him as it has helped attendants from all domains of research and academic space. The PhD researchers who are in their data collection, analysis and presentation have got the experience shared from his activities and young attendants who haven’t started their research even were benefited from process of topic selection, framing, scoping and methodologies as a way of assuring objectives attainment for their academic inquiry. This presentation was a follow up on the interesting topic of our previous presentation on Berbera basing politics: Understanding actors, interests, and animosities by Najah M. Adam. We had Mr. Brendon Novel, who is doing his research on “Saudi Arabia, the United Arab Emirates and Qatar within the Arab-African Horn: The recent multi-faceted breakthrough of high-profile and heterogeneous Gulf foreign policies (1990s-2017)”. Mr. Brebdon Novel is a Master II student at the Paris Institute of Political Studies (Sciences Po Paris) within the Paris School of International Affairs (PSIA). He is currently undertaking field work in the Arab Gulf and the Horn of Africa to document my Master’s thesis. To what extend have Riyadh, Abu Dhabi and Doha increased their own distinct political, military and economic presence through newly shaped offensive foreign policies in recent time, bringing about important multidimensional dynamics between both shores of the Red Sea? The objective of this very piece of work is to show the extent to which the state-centric projections of Saudi Arabia, the United Arab Emirates and Qatar, characterized by high- profile, personalized and heterogeneous foreign policies towards the Arab-African Horn countries have established numerous, strong, weak and sometimes destabilizing dynamics in the “Afro-Middle Eastern sub-region” (Woodward, 2002). I argue that the Arab-African Horn is a proper field where Riyadh is projecting itself as the historical Middle Eastern Hegemon, whereas Abu Dhabi is doing so as an offensive new-comer qualified as a Gulf little Sparta, while Qatar has been propelling a long-standing mediating role. These countries, according to their own interests, strategies and windows of opportunity through the 1990s-2017 period, have developed different relationships, at different time, on different levels of robustness, with their African-Arab Horn partners. They have consequently established major macro inter-states dynamics — quite often with the help of a wide range of fully state-controlled actors/tools that serve their objectives. The dissertation also puts the analysis into a highly important historical perspective and highlights major catalytic events which have spurred the three Gulf countries to increase multidimensional interactions with Sudan, Eritrea, Djibouti, Somaliland and Somalia over the analysis period. This stage had the objective of assuring a connection between ongoing PhD research and feeding masters as a building stage for a collaborative work among researchers which is the core aim of the ADIH platform. During the presentation key directions for methodology and ethical consideration for research work were discussed as a way of guiding the young researcher in dealing the significant but complex research area he is working on. International Peacebuilding and Local Success: Assumptions and Effectiveness. 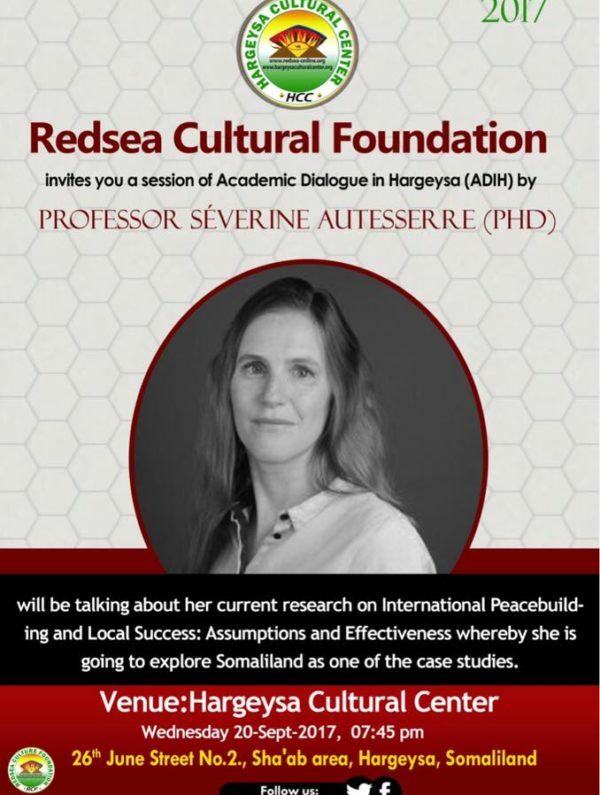 Our second phase of Academic Dialog in Hargeysa series sessions started with Dr. Severine Autesserre who is an expert in war, peace, peacebuilding, peacekeeping, humanitarian aid, and African politics Who is a Professor of Political Science, specializing in international relations and African studies, at Barnard College, Columbia University (USA). Her presentation was on her new research she is working on International Peacebuilding and Local Success: Assumptions and Effectiveness. Existing research on war and peace lacks analysis of what allows peacebuilding to succeed at the subnational level. Instead, most scholars focus on peacebuilding failure and macro-level dynamics. This is unfortunate because the obstacles to peacebuilding are such that the most puzzling question is why international efforts sometimes succeed, rather than why they fail. The lack of focus on success is also problematic because it results in ambiguous findings. On the one hand, there is an emerging consensus that local conflict resolution is crucial to building peace. There is also an agreement that, all else being equal, international support tends to increase the chances of successful peacebuilding. On the other hand, when international actors have tried to back local initiatives, they have often generated counterproductive consequences and worsened the situation. Should international actors support local peacebuilding processes? If so, how can they actually do this? Drawing on in-depth interviews, field and participant observations in nine different conflict zones, and document analysis, this article takes the first step in explaining whether, how, why, and under what conditions international interveners (including donors, diplomats, peacekeepers, and the foreign staff of international and non-governmental organizations) can contribute to successful local and bottom-up peace efforts. It makes three central contributions. First, it shows that the policy and scholarly literatures suffer from a dearth of findings on successful international support to local conflict resolution. Second, it emphasizes the critical—and under-researched—role of assumptions in shaping peacebuilding initiatives. Third, it develops a theoretical framework to analyze how assumptions influence international peace efforts. By way of illustration, the article analyzes three widespread assumptions about peacebuilding and the role of peacebuilders. In each case, it challenges assumptions that international interveners take for granted but that are actually unfounded and detrimental, while identifying assumptions that promote peacebuilding effectiveness. Mohamed is a PhD student in Peace, Governance and Development at the United Nations University for Peace, Africa Program in Addis Ababa. He has Bachelor Business Administration BBA, Post Graduate Diploma Peace and Conflict Studies and Master’s Degree in International Relations and Diplomacy, Institute for Peace and Conflict Studies- University of Hargeisa. He is also the Executive Director of Somaliland Non State Actors Forum (SONSAF) the largest civil society policy platform in Somaliland that coordinates all non- state actors. He has 17 years working experiences in civil society, institutional development, governance, peace- building, conflict resolution, democratization and elections. He was leading the largest domestic election observation missions in Somaliland 2010 presidential elections, 2012 local council and political parties’ elections and 2016-2017 domestic observers of voter registration and upcoming presidential elections. Somaliland has succeeded to recover its post- conflict political polarization through indigenous conflict resolution mechanisms and constitutionalism. It is notable that multilayered political and social conflicts resolved in between 1991-1997 without external assistances and this has contributed Somaliland to establish inclusive governance and political consensus which was the premise of power sharing and broader political and clans reconciliation. What is current the political context, helpful or fragmented? Does Somaliland fulfill the electoral standards of regional and international levels? What is anticipated electoral constrains of the upcoming presidential elections? What are the electoral dispute mechanisms that Somaliland has? In this debate the participants discussed the above thematic areas which are central to the electoral process by aligning the past experiences of the presidential elections that took place in Somaliland 2003, 2010. In this regard, there are some fundamental electoral aspects which are needed to exam and explore the possibilities of the post- election conflicts and what were the tools used in the past elections.